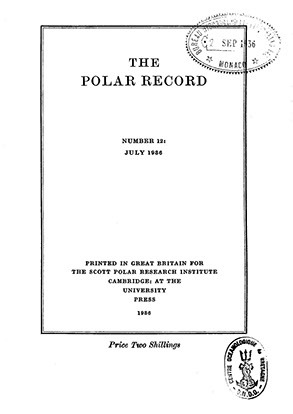 Byrd has written diaries of the expeditions in Antarctica. Here is a more technical report on the vehicles they had in the South Pole, the problems they had and how they managed challenges with frost breath. Richard Byrd was born into one of the "first families" in the State of Virginia in the US. He graduated from the United States Naval Academy in Annapolis and served in the US Navy from 1912 to 1927. During his service, he learned to fly, and developed a passion for flight. In 1926, he and pilot Floyd Bennett may (or may not) have flown over the North Pole. He also attempted a flight across the Atlantic, but a crash damaged his aircraft while on a test flight, and while it was being repaired, Charles Lindbergh made the journey. In 1928 he began his first expedition to the Antarctic. He took two ships, and three airplanes. He constructed a base camp named "Little America" on the Ross Ice Shelf, and undertook scientific expeditions. On 28 November 1929, he and three others overflew the South Pole. He returned to the US on 18 June 1930. He almost immediately started to fund raise for his second expedition, which, like his first expedition would be privately financed. 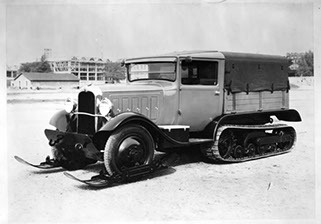 He had heard of Citroën's half-tracks, and on September 1933 Citroën received a letter from Vincent Bendix, a member of Byrd's staff, where he explains Admiral Byrd's proposed Antarctic Expedition. Mr. Bendix wrote of the media coverage that such an event might have on the Citroën brand name and lists the honors that might be made to a generous donor. "Admiral Byrd ...... give your name to a mountain range or a group of land ...... and you will get reports almost daily on radio and in print." Mr. Bendix stressed that all equipment for the expedition was to be provided by voluntary contribution and ...... "I think you would have a great opportunity for worldwide publicity over the next two years if you agree to contribute one of your vehicles to this expedition." On 14 September 1933, André Citroën informed Vincent Bendix that he would put a car at the disposal Admiral Byrd. He said he would supply spare parts, and even suggested that a mechanic specialist accompany the shipment. Byrd immediately replied by thanking the French manufacturer for the assistance but declined the offer of a mechanic. On 18 September Citroën issued an internal memorandum with a set of specifications for the half-track. The same day Citroën decided to provide a second vehicle as well as a replacement engine. The cars were painted in the Citroën colors - red with yellow stripes. The addition of a heater was also required. Admiral Byrd dispatched the following telegram to Citroën stating: "....Decided to use your tractor to cross Antarctica. I am convinced that thanks to them we will make geographic history. We would be very grateful if you could provide an additional vehicle......" Citroën promptly dispatched a third vehicle on a freighter bound for New Zealand, where the ships bound for the Antarctic were loading. Since motorized transportation still had not proven itself in the Antarctic, 153 sledge dogs were collected from Alaska to Labrador to be taken to the Antarctic. The Citroëns had the front wheels replaced with skis. Adolphe Kégresse had foreseen the need for skis on his machines, and in the late 1920's he had obtained patents in several countries, for ski attachments for his machines. snowmobiles are a mystery to me. They just appear as two lumps in a low level aerial photograph. a radius of about ten miles around camp." They appear to be tracked vehicles, with a squarish cab. The aircraft to the left is an autogiro, which proved to be useful for aerological observations. It later crashed when the crew was unaware that the tail boom had filled with snow during a storm. On the 17th of January 1934, the Jacob Ruppert, one of Byrd's ships, anchored in the Bay of Whales, near the site of Little America, and began to unload. Two Citroën half-tracks, the Cletrac, and 16 teams of nine dogs each were immediately put into service, hauling several hundred tons of supplies from the landing to the new base camp called Little America II which was established near Little America. The second supply ship arrived later, and the third Citroën was unloaded and quickly put to use. After the ships were unloaded and departed for New Zealand, the tractors set about establishing supply depots for the next summers field season. 56 men were left to overwinter. An advance base, 100 miles from the base camp, was established, as well as other supply depots. Admiral Byrd manned the advanced camp by himself. Unknown to him, vents iced up, and he began to suffer from carbon monoxide poisoning. He tried to hide the poisoning, but the base camp crew became increasingly concerned, and set out to rescue him. The first two attempts failed, but the third, using Citroën number 3, reached the advanced camp on August 10. Byrd's physical condition was too poor for the return journey, and the doctor, who had travelled in the rescue mission treated Byrd until October 12, when one of the pilots was able to fly in and remove Byrd to the base camp. The others returned by half-track. Throughout the trips to and from Little America, the tractor party was plagued by water condensing and freezing in the fuel lines. They frequently stopped to disconnect the lines and blow the ice out. I am amazed that the rubber tracks were useable at the temperatures they encountered. I would have thought they would be only slightly more flexible than iron at -60 degrees. the horizon and there were no landmarks." The first human voices were transmitted from Little America on 1 February 1934 and later a weekly broadcast was carried over the Columbia Broadcasting System in the United States. The broadcasts proved to be very popular with the public. 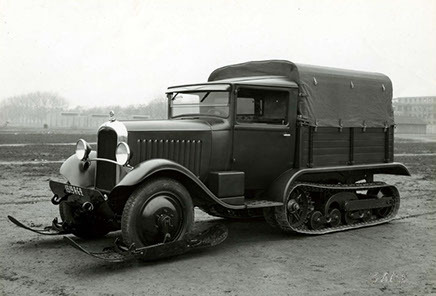 During their stay in the Antarctic, the Citroën half-tracks travelled hundreds of miles, laying out supply depots, carrying tons of supplies on sledges, and carrying scientists on exploratory trips. One caught fire and was abandoned, but the other two continued in service. The supply ships returned during January of 1935, and began loading cargo. This process continued until only the heavy tractors and planes remained at the edge of the bay. 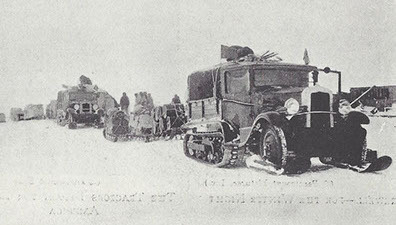 Too heavy for the Bear of Oakland, the thin skinned Jacob Ruppert slipped in through the ice long enough to haul aboard all but Citroën No.2, two snowmobiles and a small amount of various supplies. If I have done my sums correctly, I'm guessing that one Citroën was loaded. (The other Citroën had burned and was abandoned.) Also on board, headed for the Ford Museum in Dearborn, Michigan, was the Floyd Bennett... the plane (a Ford Tri-Motor) in which the Admiral had flown to the pole in 1929. The two ships moved out of the Bay of Whales on the afternoon of 5 February 1935. When you undertake this new cruise to the South Pole you will gain experience with our half-tracks on the polar ice. I want to confirm what interest we will have in France in the efforts of your mission and the results you get with our cars ... Films and photos of this daring expedition are analogous with the travels of our half-tracks in other continents. "The White Cruise" will be for all living testimony of your progress in a severe country. Regarding the photographs, I'd be happy to receive as much as possible, particularly on the progress of our half-tracks. They would allow me to place them in major French newspapers and in my briefing room at the Museum. As for movies, they will be presented at "Cinema trips" that I create at the museum and meet with the elite of the Parisian Society of politics, literature and science. Admiral, before your departure, we wish the best of health to you and your employees for proper operation of your expedition and for its success. PS: I send you a copy of "The Yellow Cruise" just published and will send you a copy later with a dedication." "Your tractors are landmarks in the history of the Antarctic, their last success was to cross 275 miles in temperatures from -20 to -70 degrees." That was the only communication André Citroën received from Admiral Byrd following his return. Citroën would have liked to have one of the half-tracks back for inspection by his engineers, but more likely to put in his museum. Perhaps one Citroën was loaded on the Jacob Ruppert, and it was returned to New Zealand, and was lost in the confusion. André Citroën later cynicaly noted that there is a mountain in Antarctica named after a car manufacturer but it was named after the son of Henry Ford - Edsel Ford. In fairness, Edsel Ford did make a significant financial contribution to the Expedition. Admiral Byrd reported on the Expedition in a 76 page article in the October 1935 issue of National Geographic Magazine.